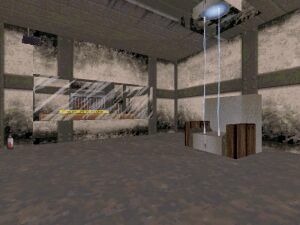 This level has some elements from E1L3. It's a jail level with all those things you have seen thousands of times before in other prison levels. Here are some bad things: Bathroom doors are too big, trip bombs are badly placed, there are no shadows (only dark rooms and bright rooms), there are many align bugs, each door has same sound, message texts (signs) use too much space etc. Also it wasn't very smart to place yellow key in a secret place (yes I did use cheats to find it). Fighting against tanks in a bathroom (tight corridors) isn't very fun. There are no details at all.